Kiwi Rail Scenic Journeys – Among some of the greatest train journeys in the world. Kiwi Rail Scenic Journeys enable you to experience the glorious views of the New Zealand countryside. 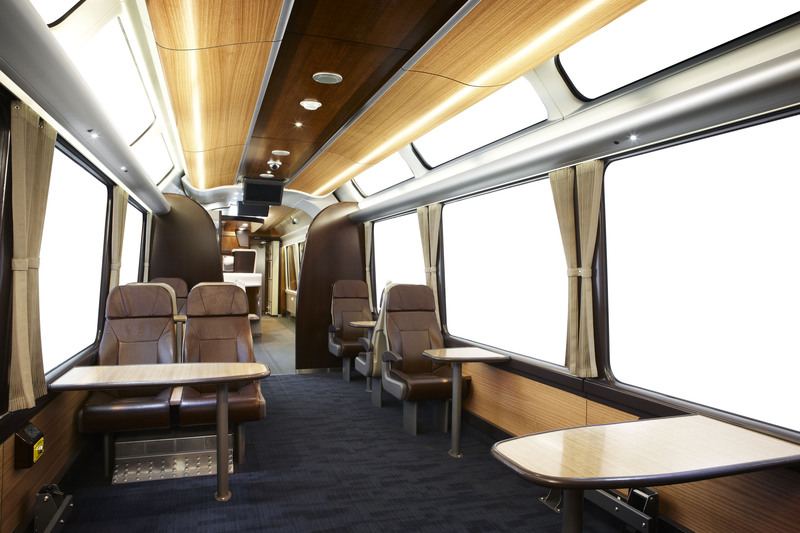 Chloe Taylor, Marketing Assistant for the Forbo Transport team, spoke to Keith Strode-Penny, Creative Director at Barnacle Design, about how he came to create the relaxing, inviting and luxurious environment within Kiwi Rail trains. What was your vision for the Kiwi Rail project? To create a “moving space” that would transform customer ideas on what rail travel could offer. Integral to achieving the vision was creating an interior environment that would allow passengers to engage with the changing scenery outside. What was Kiwi Rail’s vision? The new trains were intended to help position Kiwi Rail Scenic Journeys among the great train trips in the world. Kiwi Rail wanted to showcase the New Zealand landscape – “the view is paramount” – became the over-arching project brief. Below a fresh dusting of snow, KiwiRail Scenic‘s TranzAlpine threads it way through the Southern Alps of the South Island. The colour hues that influenced the colour palette used in the interior of the train are evident in the autumnal landscape. Where did you get your inspiration from for the project? The best architecture tells a story about the culture and landscape where that building is sited. In transport equipment, by spatial and functional necessity, that story needs to be subtle, yet recognised intuitively by passengers. Other influences included typical modern airliners which have very well resolved lighting designs which “paint” the walls and ceiling with “reflected light” from hidden light fittings. Modern super-yachts at their best, make great use of natural timber veneers to provide a sense of warmth and quality. Kiwi Rail’s trains are not high-speed TGVs. Neither do they operate through the crisp mountains of Switzerland, although they were definitely inspired by some of Switzerland’s trains. Kiwi Rail Scenic Journeys traverse the diverse landscapes of “Middle Earth” which include rolling green hills, volcanic plateaus, ocean vistas, rugged gorges, snow clad mountains and rain forests. What is the typical process you go through when you’re doing rail projects? In general, I listen to the customer brief, and then form a creative vision of where I’d like to take them. The process has evolved over the years of doing rail projects. Providing a safe experience for customers always has to be at the top of the list and this drives many aspects of any given project. In a “Post-GFC” (Global Financial Crises) world, a critical focus is on ensuring that the finished product is optimised in both its capital and future operating costs. These factors mean that good rail projects are by necessity a collaborative endeavour working with the customer’s marketing, engineering and operating teams. How important do you think it is that the interior of trains look modern and inviting? In a world faced with huge challenges, designers have an obligation to excite communities with innovative and sustainable solutions. From a customer perspective, a modern and inviting train interior helps to associate rail with the future of transport. It is especially important for the rail sector to remind customers and decision-makers that it is part of the solution to solving the problems of our planet. What was important to you when you were choosing floor covering for the Kiwi Rail project? What were you looking for? The flooring had to be robust and hard-wearing, meet demanding rail fire safety standards (BS 6853 Cat 1a), and look great. I was looking for a flooring product that would meet all the functional requirements while also have a feeling of quality and style. The carpet needed to work with the other finishes to bring the colours and textures of the high country inside the carriage. What made you choose Forbo Flooring’s Tessera Alignment FR? Alignment FR is a textured multi-height loop pile carpet that has a bold directional theme tempered by intersecting random blocks of rich cut pile.. It has a dynamic feel that hints at the fundamental qualities of New Zealand itself; a collection of islands that bob up and down in the middle of the Pacific Ocean. New Zealand was formed at the intersection of the Australian and Pacific tectonic plates which push along each other. Was sustainability important to you throughout this project? Any forward looking design project has to consider sustainability. This was especially the case for tourism trains show-casing New Zealand’s scenic landscapes. An important factor is that the carriages themselves are intended to have a 30 year+ lifespan. All-steel construction and structural design flexibility enable easy adaptation to meet a changing marketplace, including electric locomotive haulage in future. Interior finishes are durable in service and in many cases, can be re-cycled. The glazing system for the large windows is energy efficient, yet has low light reflectivity and no tint. This ensures that the views outside look good whether the weather is hot or cold, day-time or dusk. The natural timber veneers selected are sourced from Forest Stewardship Council (FSC) certified timber. What did you enjoy most about the Kiwi Rail project? Working with a great team who were committed to creating and building something special. 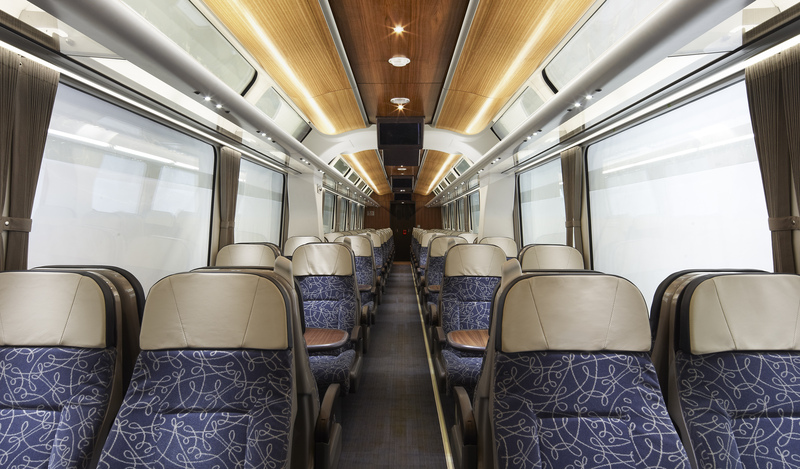 Kiwi Rail Scenic carriages won silver at the Best Design Awards in 2013. Read more about the project here.